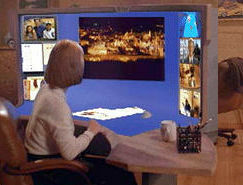 Sometimes it feels like "there are not many who remember" the unrealized predictions of pervasive videoconferencing. For most of the last decade, this page has bemoaned, commented, mused and speculated about the future of "distance multimedia", "video conferencing", "telepresence" -- whatever we want to call it. Further back, at least a quarter century, at least back to Andy Grove's vision of "Computer Supported Collaboration", a.k.a. the "Mother of all Demos", at Comdex 1991, I've wanted to believe that video conferencing could and would become pervasive. In 1996 we predicted "Videoconferencing should become mainstream by the end of the decade ..." How wrong! A dozen years later I subscribed to the plausibile arrival of The Year of Video Conferencing. How wrong, again!! And in 2010 I still wanted to believe in Mainstream Videoconferencing, but was again overly optimistic. Those disappointments led to extreme skepticism by 2012, in the presence of unfounded optimism, skepticism justified by steep revenue declines going on that very year. Thanks to Andrew Davis at Wainhouse, at VidConf.net there are now figures for endpoint revenue for 2008 through 2015. Declines continued in 2013, then small increases in 2014 and 2015 brought endpoint revenue for 2015 up to $2B, shy of the $2.11B revenue reported for 2011. Again, some analysts are thinking this is the year, while admitting to a sense of déjà vu. Maybe this will be the year. Even with more revenue this year, it will take more than one strong growth year to be convincing. For now I can remember the Yogi-ism and remember back to being a boy in the early '60s at D.C.'s Griffth Stadium, watching New York Yankees at Washington Senators games, seeing Mantle & Maris chase history, not knowing their back to back home runs were stimulating the famous quote. Could not keep on keepin' on"